Here is our list or fun things to do in Fort Myers Beach. Fort Myers Beach offers the perfect family vacation destination! From glorious beaches to fun escape room activities, all ages will be excited and thrilled with this destination. Nature lovers have a choice of stunning natural eco-systems to explore. Sports lovers can parasail, swim, hike or bike. Learn about the history and culture of the region, shop and enjoy live entertainment. 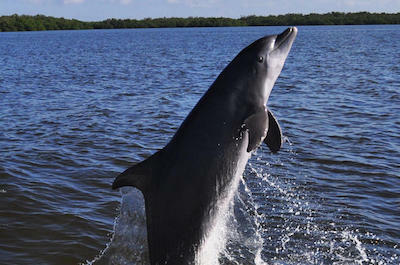 Start your holiday with one of the best things to do in Fort Myers Beach, a sailing trip to spot dolphins and other wildlife. This region is home an exotic variety of marine life and birds. Take a tour and enjoy a family friendly experience with a certified naturalist guide. Set sail on the Phoenix, a beautiful boat with all the comfort facilities you need. Your captain will cruise out into Estero Bay and the surrounding waters of Fort Myers Beach. Watch out for dolphins and manatees. Learn about the habitat, the wildlife and the eco-systems of this natural region. Bird lovers can spot massive rookeries, or nesting spots, on the high cliffs as you sail along. The cruise stops at a barrier island where you can do some shelling and enjoy a swim in the clear blue, warm waters. If you want to remain on the boat, you can relax and chat to the captain. Then enjoy a magnificent sunset as you sail back to port. Bring along your own drinks, snacks and your camera! Nature lovers will never run out of things to do in Fort Myers Beach. 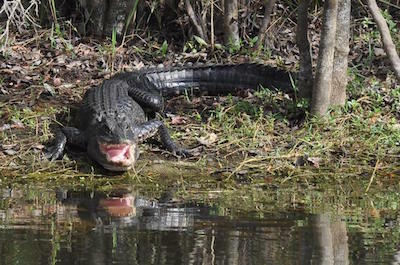 Exploring the beautiful Everglades on a day tour is something not to be missed. Your guide will be a biologist or a Florida Master Naturalist, experts who can answer all your questions and teach you as you travel around. The day starts with a drive in a comfortable van to the Everglades where you will step aboard an airboat for a thrilling 45 minute ride through the awe-inspiring mangrove swamps, sawgrass prairies and marsh habitats. After this treat, you will no doubt be feeling hungry and lunch is waiting at a restaurant in the Everglades. Make sure to try the fried alligator tail. Also on offer is grouper, clam strips, shrimp, hamburgers, chicken and salads. If you prefer gluten-free, vegan or vegetarian options, that can be arranged. After lunch you will set off on a fun 40 minute buggy ride through the cypress hardwood swamps and marsh prairies. You will climb out at an exotic bird and reptile exhibit where you can interact and learn all about these amazing creatures. Your trip ends with a wildlife drive through the Big Cypress National Preserve to spot alligators and exotic birds in their natural habitat. Not to be missed! The waters around Fort Myers Beach offer a rich abundance of wildlife and a kayak tour is one of the many fabulous things to do in Fort Myers Beach. Join a tour where an expert biologist or certified naturalist will guide you into the calm waters of Estero Bay on a kayak. Follow your guide through the mangrove estuary and look out for exotic birdlife like ospreys, eagles and herons and marine creatures like dolphins and turtles. 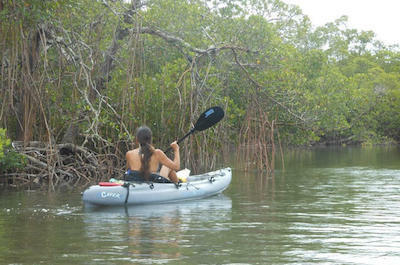 Another great kayak experience is a tour to Marco Island. Florida boasts over 10,000 thousand islands and Marco Island is the largest of them all. Follow your knowledgeable guide and paddle through the mangroves, head to the barrier where you will stop and relax on the beach and enjoy your own picnic lunch. 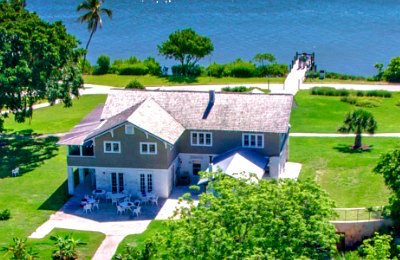 Have a swim and relax before setting off to see the awe-inspiring Rookery Bay Preserve, filled with thousands of nesting birds. For something really romantic and special, enjoy a sunset kayak trip as evening falls and the setting sun turns the sky into a magnificent palette of fiery red, orange and yellow! Kayaks on this trip are tandem, made for two, the perfect romantic rendezvous! All kayak trips are ideal for beginners, you will be given a short lesson and you are off. 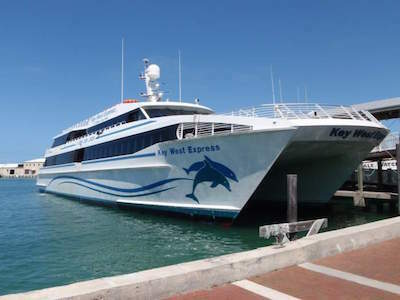 If you want to get out of the Fort Myers Beach area and explore an exciting island for the day, then the Fort Myers to Key West Bus Tour is an ideal choice for you. Your all-day adventure begins with hotel pick-up service or by meeting your expert tour guide at the Main Station in South Beach. Once there you will board a fabulous double decker bus which is equipped with air conditioning and panoramic windows for you viewing pleasure. As you travel your expert guide will give onboard commentary on all the interesting sites you will see along the way. Your first stop will be 30-minutes for breakfast at your own expense. 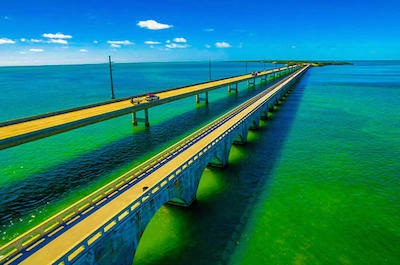 When you are finished with breakfast you will continue to drive along the Overseas Highway which features over 42 bridges and gorgeous views of the scenery. When you arrive on Key West you will have 6-hours of free time to explore the island. You can choose from a variety of activities which range snorkeling to visiting the Mel Fisher Maritime Museum to checking out Mallory Square or the Ernest Hemingway Home and Museum. You will have the opportunity to plan and purchase tours while you are driving. Another option is to spend the night on Key West and return the next day on the double decker bus tour (you must buy separate one-way tickets). Your exploration of Key West ends when you are dropped off at your original place of boarding the bus. Whether you are a beginner or have years of experience, joining a fishing tour is a great thing to do in Fort Myers Beach. Head off on an exclusive charter that sails inshore into backwaters of Cape Coral and Caloosahatchee River! This is a unique eco-system and fishing is perfect all year round. The waters are calm and the trip is ideal for all ages and levels of fitness. Best of all, there are no waves and no seasickness! All the necessary equipment is included and you will have a private guide for a truly personalized experience. Your Captain will give you fishing instructions and casting lessons if you are a beginner. If you are an expert, he will go over advanced techniques that will enhance your skills. Set off and try your hand at catching Snook, Redfish, Tarpon, Cobia, Snapper, Grouper and perhaps a shark! You can release your catch back into the water or if you feel like a special dinner, make use of the cleaning and bagging equipment when you return to the dock. Boats have coolers and water on board and you can bring along your lunch and treats. 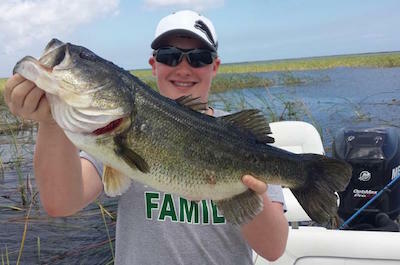 If you want another fishing experience, head off on a private charter to Lake Okeechobee, famous for the large mouth bass that it produces. You will need to purchase Florida freshwater fishing license and live bait. Your captain is a full time guide and all necessary equipment is provided. This amazing experience offers a Ôno fish no pay policyÕ. You will never run out of options if you are searching for day-filled things to do in Fort Myers Beach. 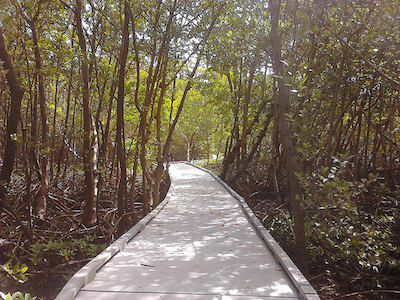 Spend a relaxing day in the beautiful Lovers Key State Park. At one stage it was only accessible by boat, giving it its apt name! Today you can get to the Park along a scenic boardwalk or a fun tram. This two mile long beach offers shelling opportunities, safe swimming, sun tanning and picnicking. It is also a wonderful haven for all types of wildlife. Wander around and see roseate spoonbills, bottlenose dolphins, marsh rabbits, West Indian manatees and bald eagles. You can enjoy the trails which are ideal for hiking or cycling. The Park is made up of four islands and boat lovers can set sail from the boat ramp and explore the waters that are filled with an abundance of marine life. You can also take part in a relaxing kayak paddle, a canoe trip or try your skills at paddle boarding. Then, rent a beach umbrella and chair, relax and soak up the stunning beauty of this natural Park. 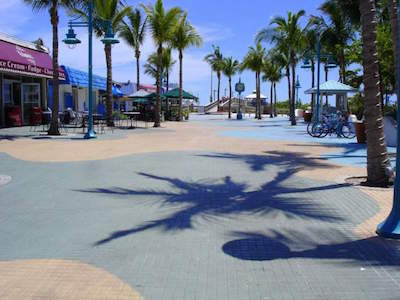 When you are visiting Fort Myers Beach, an unforgettable thing to do in Fort Myers Beach is to take a trip to Key West on the Key West Express. Book your trip for the family or group of friends and meet the fast speed, luxury Ferry at Fort Myers Beach. Climb aboard, settle down and get ready to cruise over the ocean at 34 knots while you sit back and relax. The Ferry offers air-conditioned interiors, outside sun decks, comfortable couches, tables and reclining airline-type seating. There is a full service galley a bar and flat screen TVs with satellite television to enjoy during the trip. The ship is run by a professional and highly skilled team who will look after all your needs. When you get to Key West you can spend time enjoying the fabulous facilities on offer. Take a ride on the Conch train, join a 90 minute bicycle tour to see the sights, visit the Ernest Hemingway Home and Museum. There is also a fascinating Shipwreck Museum and a Butterfly Conservatory for nature lovers. Enjoy a great meal at a famous restaurant and then head back to Port for your sailing trip back to Fort Myers Beach. A not-to-be-missed experience! Indulging in some retail therapy is the next thing to do in Fort Myers Beach. Set off to Times Square and enjoy a day of shopping, eating and entertainment. 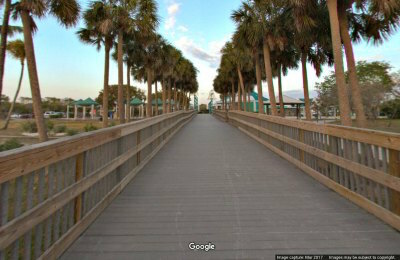 It is located on the scenic Fort Myers Beach Pier and is one of the most popular spots for both locals and tourists. Walk around and explore the fun gift shops, make sure you pick up the obligatory Fort Myers Beach T-shirt! Art lovers will enjoy the galleries and the local street art, chat to the artists and select something special to take home. Relax in an outdoor cafe, order an exotic ice cream treat and enjoy a show offered by street performers. You can see everything from live bands to dancing and circus acts. After that how about getting that tattoo you have been dreaming about? There are a number of famous Tattoo shops located right here. Stroll around and enjoy the stunning views of the Gulf of Mexico. At night, the venue rocks with bars, clubs and adult entertainment. You will certainly want to visit more than once! After the hustle and bustle of Times Square you will probably need some thing to do in Fort Myers Beach to chill out and relax. 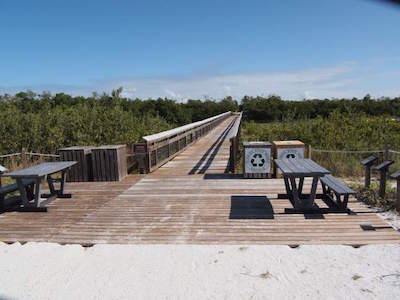 Head for the beautiful Matanzas Pass Preserve, located on the barrier island of Estero. This 60 acre preserve runs along the Matanzas Pass and remains a sparsely developed and protected area on the island. Get a feel for nature as it was before the region became a popular tourist venue! There are four plant types that inhabit the Preserve, tidal swamp, Black Mangrove forest, maritime hammock and coastal grassland. Walk along the 1.25 miles of easy-to-navigate boardwalks and look out for Wild Cotton, Florida Mayten, Jamaican Caper and Cat Claw. Also calling this natural region home, are hawks,owls, raccoons, rabbits, turtles, herons, fish, snakes and song birds. If you are a serious naturalist, there are many guided tours, educational sessions and volunteer tours that will get you hands on. If not, just soak up the perfect ambiance of this natural venue and enjoy a quiet day relaxing. 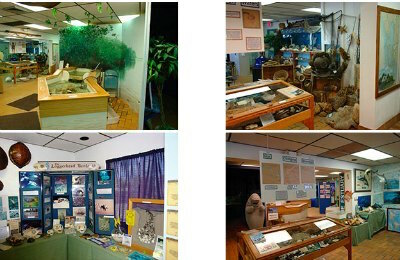 Getting inspired at the Ostego Bay Science Center is the next exciting thing to do in Fort Myers Beach. This amazing center offers a full marine experience for the family with interactive exhibits, aquariums filled with exotic marine creatures, touch tanks, one of kind collections and unique displays. The Center is located on San Carlos Island and makes a great day outing, especially when you have had enough beach and sun! Learn all about the natural beauty of south west Florida. You can choose a guided tour or walk around on your own on a self-guided tour. Join in a feeding session when exotic creatures come out to eat! Touch a starfish and see how sea turtles hatch. If you are brave, put your head in the mouth of a shark! The professional staff will tell you about the Dolphin Research Study that keeps track of the local Bottlenose Dolphins in the waters. There is also a specialized Mission Manatee, educating people and caring for the manatees in the area. If you really want to get hands-on, join a volunteer program for a day and you will have memorable memories to share when you get back home. In the mood for a cultural learning experience? Here is a recommended thing to do in Fort Myers Beach. Set off to Mound House and enjoy a day exploring this unique and fascinating ancient island set on top of a shell mound. Start at the Museum where you can take a self guided tour and learn all about Calusa Indians, the Early Settlers and natural environment of Estero Island. View the ancient hand made objects that have been unearthed by archaeologists. Watch a weapon making demonstration and then try your hand at making some Calusa tools. Take part in an arts and crafts workshop and create a unique masterpiece to take home! Then head outdoors and explore the 2000 year old Shell Mound. If you are feeling energetic, join a kayak paddle with a guide to learn about the eco-system, fauna and flora of the region. When you are on dry land, enjoy a guided beach walk, learning about the culture of the ancient tribes that lived here. The Observation Pier makes the perfect place for stunning views and a few selfies. Relax in the Gardens and enjoy a picnic under a shady tree. This is a fabulous day outing for the family. There is no shortage of magnificent beaches to explore, and spending a day at Bunche Beach is another spectacular thing to do in Fort Myers Beach. This 718 acre venue is a natural tidal wetland located on San Carlos Bay. The area is a unique eco-system offering sandy beaches, Mangrove forests and salt flats. It is home to a huge variety of species of birds, animals and plants and will delight nature lovers. Take your picnic basket, camera and get ready for a day outing. For those who enjoy being on the water, there are two paddlecraft launches where you can set off on a kayak, canoe or paddleboard. If you want to stay on land, enjoy some wildlife viewing from the view point or try your hand at fishing. Stroll along the scenic 310 foot boardwalk for stunning Ocean views and wonderful fresh sea air. 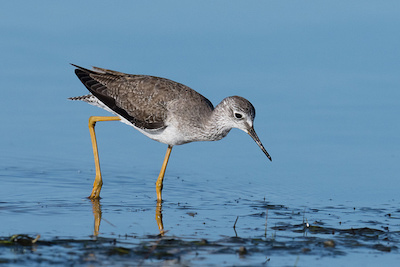 The Beach Preserve is a designated Great Florida Birding Trail site and you can join a Bird Patrol Tour to learn more. This facility is built totally according to green living practises, with all electric needs provided through solar power. Get hold of a map and guide on arrival to make the most out of your visit. One thing to do in Fort Myers Beach that you simply cannot miss out on is spending a relaxing day in Bowditch Point Park. This 17 acre recreation area is located at the north most tip of Estero island. Part of the Park is available for the public and part is developed as a restoration and preservation area. Enjoy the quiet, relaxing ambiance of this serene venue. Sit at the bay and watch the boats entering and leaving. There are secluded tables and barbecues where you can enjoy a family bonding meal in a shady spot under the trees. When you are done, enjoy a walk along the beach, a swim or work on your tan. Hikers will love the trails that offer a chance to spot exotic birds and creatures as well as breathtaking views of the Bay. Rent a boat and set off to sail on the calm clear waters for a view from the ocean side. You can also kayak, canoe or paddleboard. The Park is a designated Great Florida Birding Trail site. Facilities for people with disabilities are available. Pick up the guides and maps when you arrive to get the most out of your day experience. 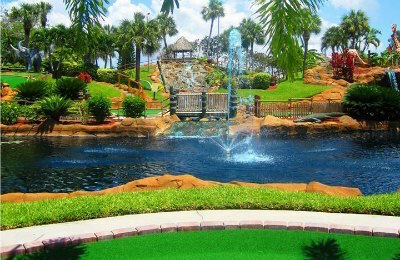 When you want to experience fun for the whole family and view some beautiful scenery as well as play miniature golf, then a superb thing to do in Fort Myers Beach is to stop by Jungle Golf. The setting at Jungle Golf is more than just a miniature golf course and you will follow in the footsteps of the Earl of Greystoke also known as Tarzan, the Lord of Jungle. This miniature golf course will take you exploring for King Solomon’s Mines while you putt around from hole to hole. You will be delighted with lush green scenery that includes a lagoon, numerous waterfalls and manicured gardens. Whether you decide to play during the day or night the atmosphere will bring out the explorer and competitive side of you. Playing miniature golf at Golf Jungle is the perfect way for families and groups to bond while being challenged by the best miniature golf course in the Fort Myers Beach area. 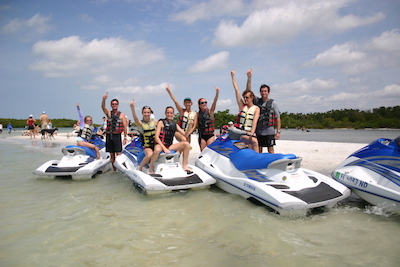 If you are searching for the ideal watersports company that has several locations and offers numerous things to do in Fort Myers Beach, then you should try Holiday Watersports Fort Myers Beach. With three locations to serve you, Holiday Watersports Fort Myers Beach offers a wide range of fun activities for the whole family. You can start with beach equipment that is perfect for lounging on the soft sands under a cool umbrella for shade. When you want adventure try one of their dolphin adventure tours which will have you riding a wave runner and following a school of dolphins. If you want adrenaline then rent a wave runner or take a stunning parasail flight over the gulf. More relaxing options include kayaks, standup paddleboarding and there are sail boats to rent. Holiday Watersports Fort Myers Beach can accommodate all of your beach needs from lounging to exciting watersports which makes them an ideal choice for beach goers of all types. One of the most adrenaline and relaxing things to do in Fort Myers Beach is to go up in the air with Paradise Parasail. In business for over 30 plus years, Paradise Parasail is the perfect operator to have you soaring above the Gulf of Mexico. Once in the air you will enjoy breathtaking views of the area as you gaze downward on the marine life and gorgeous turquoise waters of the gulf. While you are flying 500-feet in the air you will have several options from free falling to relaxing dips. You can decide how many people you want to fly with from one to three and you can even have your flight filmed for future memories. An added bonus with Paradise Parasail is cruising in the boat out into the gulf where you might see dolphins and you can peer back on the built environment of the surrounding area. Parasailing is the perfect add-on for any day at the beach. When you want to get out or over the beautiful Florida Gulf then an ideal thing to do in Fort Myers Beach is to take the family to Mid Island Watersports. Family owned and operated for 23 years, Mid Island Watersports has the perfect watersport equipment and activities for the whole family to enjoy. Once here you can decide to rent a wave runner that can accommodate one to three people or take a banana boat ride. Renting a standup paddleboard is a great way to get some exercise while gazing into the beautiful waters of the gulf. 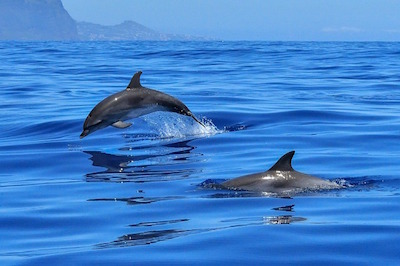 Mid Island Watersports offers thrilling dolphins tours that will have you riding a wave runner next viewing a group of dolphins playing in their natural habitat. 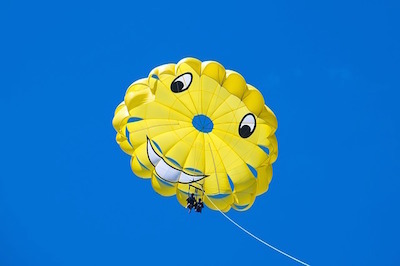 Another adrenaline filled activity is to go parasailing where the whole family can peer down on the marine life and gorgeous waters of the gulf.